﻿ Is It Possible to Upscale and Rip DVD to HD Video in 720p/1080p? People's pursuit of higher image quality never stops. That's why the attention of HD 1080p and even 4K 2160p video hits an all-time high each time it came out. No surprising to see various questions of ripping and upscale standard def DVD to HD 720p or 1080p video on various forums. Is it possible to upconvert DVD to HD from 480p/576p to higher resolution 720p or 1080p? Will you gain quality enhancement after the DVD to HD ripping? Read the post below. Best DVD ripper software to rip protected DVD to HD MP4 (HEVC, H.264), MKV, AVI, MTS, etc and change the DVD resolution from 480p/576p to 720p, 1080p and more with the fastest speed and highest possible quality. Part 1: What is Standard DVD Resolution? There are two resolutions that the DVD format can support - 720x480 pixels per frame for NTSC and 720x576 pixels per frame for PAL. Accordingly, DVD is generally regarded as a standard resolution format. Part 2: Why It's Unreasonable for DVD Resolution Upscaling? "I have a question about should I upscale DVD to 720p resolution? My old NTSC DVD looks terrible and interlaced. I tried Handbrake but it doesn't improve the resolution. Is there any thing I can do to fix that DVD?" Upscaling sounds like to be an effective solution to improve quality. Even the source DVD offers a resolution of 720x480, the quality could be possibly improved by taking advantage of the process and change the DVD resolution from 480p to 720p or 1080p HD. Is that really true? Hold on. To be frank, upconveting DVD to HD video in 1080p or 720p cannot add more details than is already present. The visual experience depends the resolutions of not only your source DVD but also your equipment used. The 480p movie viewing experience on your HDTV will never look crisper than that on your smartphone. In contrast, visual artifacts and distortion will be noticed when you are closer to your HDTV or other bigger screen monitor. Meanwhile, by ripping DVD to HD 720p/1080p video, the resolution is enhanced, which also leads to file size increase, and at a result, you will need more storage space to store the movie. So we don't recommend you upscale DVD resolution to HD 720 or 1080p. Commercial high quality DVD ripping software boasts video quality enhancement during DVD disc conversion and upscaling. Don't be fooled by the marketing gimmick. Generally, ripping DVD to any other resolution is a big no-no to image quality. Any video transcoding will involves in quality degradation. All you have to do is to preserve the highest possible quality while digitize disc. With high quality as the main in DVD ripping, MacX DVD Ripper Pro successfully maintains the maximum image quality and manages to rip DVD to high-definition formats like MP4, MKV, TS, MTS, M2TS, AVCHD, etc, thanks to the High Quality Engine and Deinterlacing technology. Most importantly, it is built in a unique DVD analysis engine that is helpful to analyze all kinds of protected DVDs, be it 99-title discs, newly released movies, workout DVDs or other unplayable discs. After free download this DVD to HD ripper and run it on Mac or get Windows edition download running on Windows (10) PCs. Then hit "DVD Disc" button to finish the DVD source importation. Alternatively, you can hit "DVD Folder" to import this disc file. From the drop-down list of "Output Profile", navigate to the "to TS Video" category. From the sub-category, you can choose the most appropriate output format. Here selects the MTS video as the final output format. 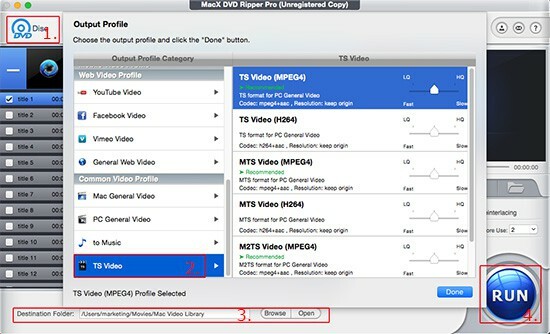 Touting more output formats, this program offers you a golden chance to rip and convert DVD to FLV for uploading to YouTube, rip DVD to MP4 for playback on iPhone, iPad, iPod, DVD to MOV for watching on QuickTime, etc. Click bottom-right "RUN" and start to rip DVD to HD MTS video format on Mac. Note: MacX DVD Ripper Pro features unique level-3 hardware acceleration technology, which helps to fasten the whole DVD transcoding process to a new high. Even when you rip DVD to HEVC for better image quality, you can finish the whole ripping process within a short amount of time. 1. In addition to ripping DVD to HD video on Mac, MacX DVD Ripper Pro overshadows other similar programs by furnishing more than 400 output profiles for mobile devices, even the latest gadgets, like ripping DVD to iPhone XS/XS Max/XR, Samsung Galaxy S9, Huawei P9, etc for later playback on the move. 2. In case you just want to backup DVD to HD MKV, MTS video to store in your computer hard drive for digital storage and protection, instead of converting to other portable device, the "Copy" feature of this program grants you to backup your DVD collection original video quality and original 5.1 channels Dolby AC3/DTS audio. - DVD Decrypter: Rip DVDs protected with CSS, Region Code, Disney X-Project DRM and more. - DVD Copier: 5 minutes only to backup a full DVD full title, main title, ISO image with original qualtiy. -DVD Converter: Rip DVD to HD MP4, MKV, AVI, WMV, etc for iPhone, iPad, Android, with ease.